Boy howdy, I am a tired librarian this weekend. This past week was our school district's Spring Break, which means that the library was uber busy. We had some fantastic programs, including a Life-Sized Candy Land program which you'll be hearing more about in a week or so on the ALSC Blog. Stay tuned. Remember all that wonderful buzzing about the best YA books you never heard of? Well, Kelly's hosting The Great Unsung YA 2010 Giveaway, so go on over there and enter by April 12. Travis of 100 Scope Notes takes a look at book bullying via the star rating system on Amazon. Personally, it irks me when books are given one- and two-star reviews based on things like Amazon's shipping or the fact that it's a children's book and not an adult book. What do you think of Amazon's star ratings? How seriously do you take them? Jen Robinson pointed me to a New York Times article about a father and daughter who read together for 3,218 nights in a row. This is a fantastic testimony to the bonding power of sharing books with your kids. This kinda slipped under my radar, but Newbery-winning author Sid Fleischman died last week at age 90. According to the article, he wrote over 60 children's books, including The Whipping Boy, which won the Newbery medal in 1986. Thanks to Confessions of a Bibliovore for the heads up. 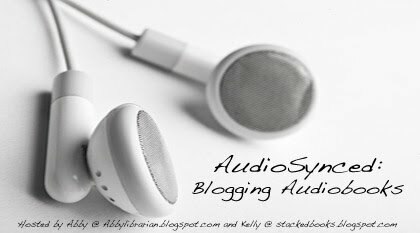 Don't forget to post about an audiobook in March and submit your link to our April AudioSynced Roundup! (I admit, I have not yet done an audiobook post this month. It's coming! I promise!) On April 1, I'll be posting a roundup of audiobook reviews and posts around the KidLitosphere. If you don't have a post for March, that's okay - Kelly will be hosting the roundup at Stacked in May. And that's all I've got for you today (have I mentioned that I am TIRED?). Have a lovely weekend! A month or so ago I was making a display about the ALA award winners and noticed three one-star Amazon reviews of The Lion and the Mouse. All three of them were from people who felt gypped because the book HAD NO WORDS. On the plus side, that inspired me to create a program about how to use wordless picture books (although I still haven't done said program yet). Will have to pass on the audio book challenge. I can't stand to be read to! At least this week I am reading aloud an excerpt from Knucklehead to my 25 classes this week, something I rarely do!